While staying at a remote lodge during a fishing trip Ironside and Ed become involved in a murder investigation. 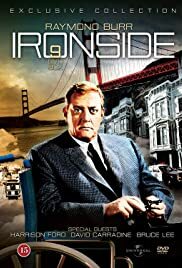 This Ironside episode finds Raymond Burr and Don Galloway off in the Ironside vehicle taking a little R&R in Nevada heading for a fishing vacation. They run into a murder of a lawyer at a club run by gambler Robert Webber. The guy charged with the murder is Don Hammer whose house they left after asking direction and the lawyer is Webber's attorney. Webber's the kind of guy who has to have an attorney at the ready on speed dial if that had been invented in 1973. He's the guy you know did it and it will be a pleasure to nail him. In fact courtesy of Raymond Burr he's nailed a couple of ways. In fact this guy is so loathed that the local sheriff Scott Brady welcomes Burr's participation in the investigation. Usually local cops aren't crazy about outsiders, but in this case Brady just wants to get Webber. In fact Webber a truly amoral and malevolent sort of being is the kind of villain you love to hate. He really makes this Ironside episode enjoyable.